Twenty years of drought in the Southwestern US has resulted in mega-forest fires and depleted reservoirs, and challenged decision makers to find new approaches to managing a growing population facing a dwindling water supply. 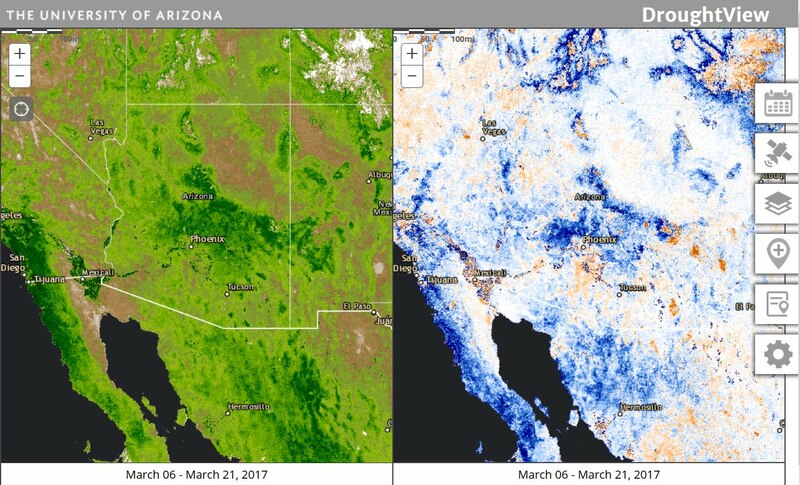 And then along comes DroughtView, an interactive web application that leverages satellite imagery to identify areas impacted by drought. "It's a Swiss Army knife for land management out here in the Southwest," says Michael Crimmins, a UA Cooperative Extension associate specialist in the College of Agriculture and Life Sciences. "We can see where areas are 'brown,' and that will give us an indication of where there's fire risk. As fires burn, we can actually watch them on DroughtView," said Crimmins, also an associate professor in the Department of Climate Science, Soil, Water and Environmental Sciences.